This is the most amazing chess game you ever seen. Doctor Who characters good and bad are captured in 3d boxes to show you the most amazing 3d lenticular images and this are just the peaces to play chess with. Of course the game becomes even better if you know how to play chess. 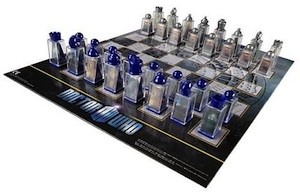 But a Doctor Who chess set is something that should no be missing in your collection of Doctor Who items. Go check out the details of this Doctor Who Animated Chess Set.